Nosode Kit contains 4 remedies for emergency preparedness and your peace of mind. $80 value purchased separately. Kit regularly $65, NOW 15% off. Specifically put together for emergency preparation for possible exposure to toxic substances, bioterrorism, infectious disease. Remedies may also be suitable to treat first-aid illnesses and symptoms. Kathryn Jones includes a short, but valuable user friendly dosing guide. Emergency Nosode Kit is offered as complementary alternative medicine (CAM) to use as an adjunct to your health plan. Our information is not intended to diagnose, mitigate, prevent, treat, or cure any symptom or disease as defined by the FDA. Homeopathy is known for its past track record in epidemics. Anthracinum 30C for skin boils, for Anthrax exposure. 400 pellet size. Variolinum 30C for acne and a Smallpox exposure. 400 pellet size. E Coli 30C for E Coli poisoning; urinary irritation. 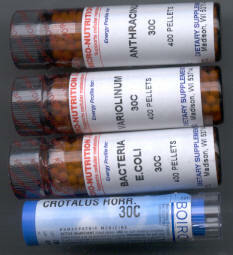 E Coli is also listed as Colibacillinum. 400 pellet size. Crotalus Horridus 30C for viruses, photophobia, internal bleeding. Crotalus is listed in Dictionary for Practical Materia Medica as a remedy for hemorrhaging, malaria, yellow fever, tetanus, liver disorders. 400 pellets. Kathryn Jones, Health Counselor, advocates health rights, alternative health care and the importance of education in making informed health decisions. Nosodes are safe homeotherapeutic vibrational preparations of viral or bacterial substances. There are no whole molecules of the actual substance in 30C potency. Dorothy Shepherd in the book, More Magic of the Minimum Dose, writes, "What do homoeopaths want immunizing substances for? We have got much better agents which have been used clinically and proved many years before immunization was even thought of. We call them nosodes."